What is the difference between: integrated amplifiers, Pre-amplifier and a Power amplifiers? A Pre-amplifier provides all off the inputs and control elements of a standard (integrated) amplifier (and more! ), but does not have any power amplification, or in other words: the device, that would be needed to drive loud speakers is intended to be provided by a separate unit. To separate pre-amplifier and power amplifier out into separate units is usually done for High-End Top of the line Hi-Fi systems. It allows the choice of a power amplifier appropriate to ones listening needs (some people have power amplifiers that provide in the thousands of Watt range), - and to place the power amplifier in a different location than the rest of the stereo components, which is particularly convenient, when high powered power amplifiers are used, which are often large and heavy or require noisy cooling. Integrated Amplifers or in short: amplifiers provide a pre-amplifer section and a power amplifer section "integrated" into one unit. some integrated amplifers and receivers provide external links that can be removed to separte the pre-amplifer section form the power amplifier section. This allows to use such a unit as a pre-amplifer, to add a different possibly higher powered power amplifier, or to insert an audio/effects processor between the pre-amplifer and power amplifer sections, such as an equalizer or reverb. If listening through headphones only would be the only usage for the unit (no speakers), then no power amplifier will be needed, provides the pre-amplifer has a built-in heaphone amplifer, which some pre-amplifers do and others do not. The difference between amplifiers is mainly how much output power they provide and to what specifications they adhere that relate to sound quality, such as total harmonic distortion, inter modulation distortion and damping factors. Phase Linear 4000 Vintage US made Pre- Amplifier designed by Bob Carver: First my apologies for the poor photos - As time allows I will update. There is a difference between equipment manufactured in the USA, Europe or elsewhere. 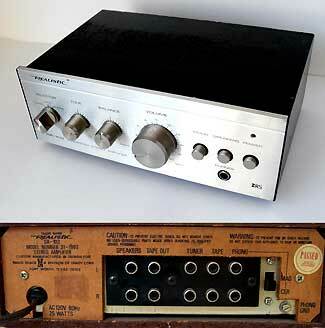 This is an example of a very fine well crafted rugged yet luxorious pre-amplifier. 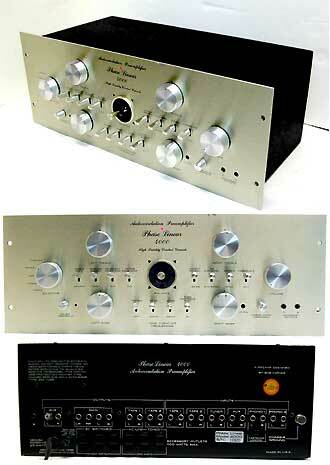 Remeber the days when the first Marantz stereo equipment was manufactured in the USA? This unit appears to me to be inspired by exactly that. This pre-amplifier sets itself apart from other pre-amplifiers, as it offers the following custom ciruitry, which especially is useful for vintage vinyl / phono listening (and recording! ): Auto-Correlation as noise limiter, Peak unlimit to remove the frame in which records are squeezed to prevent acess stylus movement and thispre-amplifier offers SQ circuitry for simulated quadraphony (it had 4 chanels out controlled by a "joystick" balance control. The unit is constructed so all circuitry is on separate plug-in cards one for each circuit. This is finest quality heavey duty all metal equipment - no plastic used in it's casing. They just don't mak'em like that anymore! This unit was fully refurbished with a very detail oriented job to bring it back to original specs for lively vibrant sound to perform reliably for decades to come: Aged solder points were re-soldered - in addition to my usual quality work. Tired of digital equipment that Just does not satisfy with it's sound and brings listening fatigue? Get this old school analog Hi-Fi stereo equipment that was built to the highest standards of quality - not to cheapest production costs like equipment made today. Make music listening fun again, but also perfect record records to the digital realm! This unit will work stand-alone as it was upgraded with headphoen amplifiers that allow to plug headphones into the front panel without the need of a power amplifier. You will enjoy thsi unit for it's nice and detailed warm and natural sound! Condition: In contrary to what is seen due to image compression in the photo, the unit looks very nice with only minor signs of use (will gladly e-mai lhigher resolution images - Please inquire). The unit is in refurbished and excellent working condition. The unit is also in great physical shape. As with all my photographs - the actual unit is shown..
Work performed To present this unit in fully and reliably working condition and to perform to specs: took the unit apart completely and re-soldered all solder points. reworked the metal of all internal connectors, switches and potentiometers with quality contact cleaner; Full functional test; Phase distortion , level and frequency response test (measured to 50 Khz): perfect; physical cleaning and detail work. Lot: 1 Phase Linear 4000 Auto corelatin Hi-Fi stereo amplifier. This unit differs form other 4000 as it was upgraded with 2 headphone amplifiers (front and rear chaneels); Can include CD with PDF owenr's manual - please request. Note: The unit was tested to perform to specs, but still contains it's original electrolytic capacitors. If wanting to have these replaced with new ones throughout the entire unit for long term reliability, please add $150 ot the price below. Price: $550.00 - A true piece of quality USA made vintage audio equipment that sounds considerably better than most currently manufactured equipment! Works perfectly + Great Physical Shape!  "Old School" Analog and Descrete!  3 Switched + 1 Unswitched AC jacks. 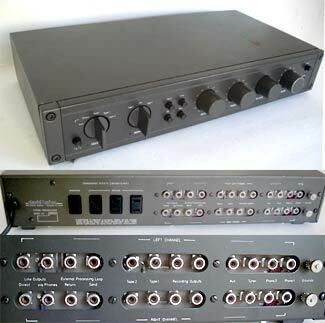 A nice quality USA made amplifier form about the 1970's - This amplifier is "old school" - all analog: no digital signal switching - still: mechanical analog swithces and knobs and quality electronic components uused! 2 "Phono" Inputs for extensive turntable usage - of couse! Designed by David Halfler. The unit is all metal constuction with heavy all metal knobs. Condition: The unit was re-worked in various aspects and is in excellent working condition. The unit is in good physical shape (photo of the actual unit shown). The unit is clean but has typical signs of age and use. There is one spot where the paint tore off and rusted. Volume control knob worn at edges. Other than that: good physical appearance. As with all my photographs - the actual unit is shown. Please inquire for higher resolution imges. Lot: Hafler DH-110 stereo pre-amplifier, - A Great Value for the money - Get this amplifier while still available. Price: $285 A high quality USA made pre-amp at a great price!  Phono Input for turntable.  Front Panel Accesible Tape -Inputs / Outputs.  Mic Input with Mic Mixing.  Hook up for 2 speaker pairs. Want to listen to records again? Get this amplifier and a turtnable to spin vinyl again. You can even DJ a party - has Mic input that can be mixed into the signal. Condition: The unit was re-worked in various aspects and is in excellent working condition. The unit is also in good physical shape - some signs of use and age such as scratches and digns (minor) The photo shows the actual unit - If needed Iwill be glad to e-mail highesr res and larger photos). The unit is clean and has only typical signs of use, nothing major. 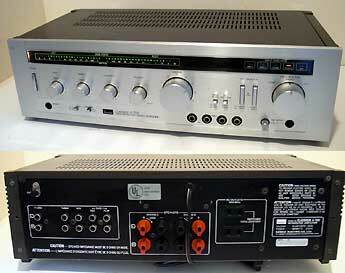 Lot: Sansui Intergrated stereo amplifier, model: Classique A-700 - A Great Value for the money!  "Old School" Analog - Descrete no ICs!  6.3 mm (1/4") Headphone Jack. Vintage Analog Integrated MINI Amplifier: A simple, yet very vesitile amplifier, that even sounds great - "Big Bang for the Buck" this amplifier is still "old school", probably form the 70's - all analog: no IC's - all descrete transistors, even in the phono stage. when compare to a simlar amplifer that uses ICs: This one offfers sound that sounds more direct wit more detail and clearity. Yes, there is a "Phono" Input for a turntable, and this amazign little guy even supports turtnables with ceramic cartridge by providing a switch that switches between: Magnetic and Ceramic. This amplifier is really small: only 9 1/4" wide, so will fit almost anywhere. The perfect addition if wanting to listen to a turntable again - and also perfect for computer hook-up for recording ye' old records: the tape recording output of this amplifier allows to use this amplifer as a "phono pre-amplifer" - in other words: take a turntable and a hookup cable to connect this amplifier to record records into the computer - via the audio line level input that the computer provides! This amplifier is the perfect addition to an old fashioned record changer - to listen to those records again without spendign a bundle! Features (as at the front panel - left to right): nput selctor rotation switch: Tuner, Tape, Phono, Tone Control, Blaance COntrol, VOlume Control; Mono/ Stereo Switch; Spealers On/Off, Power switch with power iindicator LED, Head Phone jack; REAR Panel: RCA jacks (L top, R bottom): Speakers, Tape out, Tuner, Tape, Phono, phono selector switch: Mag. / Cer. Condition: The amplifier was repaired and then re-worked in various aspects to present it in perfect working condition. The unit is in fair physical shape (photo of the actual unit shown). The unit is clean but has visible scratches and dings. As with all my photographs - the actual unit is shown. Please inquire for higher resolution imges. Work performed To present this unit in reliably working condition and to perform to specs: repalced defective ballance potentioeter, re-soldered aged solder points, reworked all controls and switches with quality contact cleaner; Full functional test; Phase distortion and power output test, frequency response test - OK; Note: The wood casing of this amplifer was covered with plastic veneer, which had peeled off. I took that off, as damaged and painted the wood case black. It looks good, but removing the veneer coudl not be done wihout pulling particles out of the wooden board on the top side of the amplfier which creates a slight texture in the paint. So: looks good, but is not pefect. Other work: physical cleaning and detail work. If I'd bill for all the work that wnet into the repair and then restoration of this amplifer it would exceed $100. Price: See above: "Work performed", then MAKE fair OFFER. Works perfectly + When ever I get little amps like this one, they usally sell wthin a couple of days!